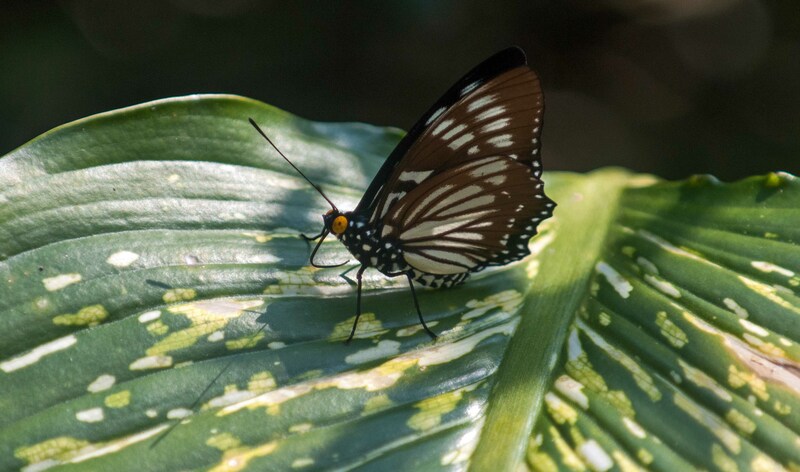 What stands out most about this butterfly are its bright yellow eyes. I don’t know what function the yellow has, if any, but it offers a beautiful contrast to the black, white and brown colours of the rest of the butterfly. I’m not sure how it got its name: The Courtesan (Euripus nyctelius) . It may relate to the fact that the females of this species come in a variety of different forms (i.e. they are polymorphic), or it might be because it appears rather well dressed and courtly! 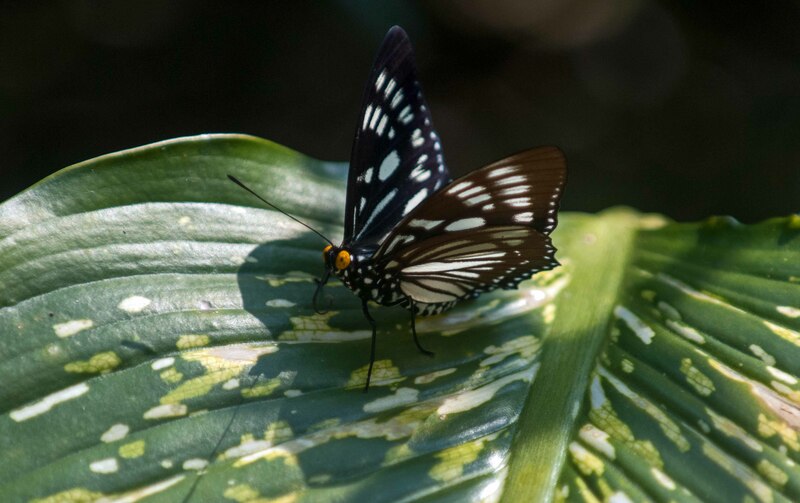 The butterfly, which existed for millions of years without the benefit of a name, was first named, that is to say given a scientific name, by a gentleman called Edward Doubleday Esq, in 1845 (1). It was originally called Diadema nyctelius. Reading the 1845 Volume 16(1) of the ‘Annals and magazine of natural history’ – which is wonderfully easily available in this digital age (1) – makes me think that he did not actually see a live specimen, because there is no mention of the yellow eyes! The insect was described as ‘being in the collection of the collection of the British Museum’, so perhaps it was collected in somewhere in South East Asia and sent to the museum for identification. The Courtesan is relatively rare in some places, such as Singapore – which is perhaps not surprising! (see links 2, 3) – but in Thailand, where I took these photographs, it is listed as being common (4). Unfortunately, I did not see – or photograph – any of the females of this species, which I saw in Doi Chiang Dao, Chiang Mai Province, Thailand. The sexes are dimorphic (i.e. the males and females look different!) and the females are polymorphic (i.e. they come in different forms!). There are also different types of female forms in different places, which would make this species an excellent subject for an in-depth study (has anyone done it I wonder?). There are at least five different female forms (black, dark brown, iridescent blue etc.) which mimic different models; meaning that they look like completely different butterflies. 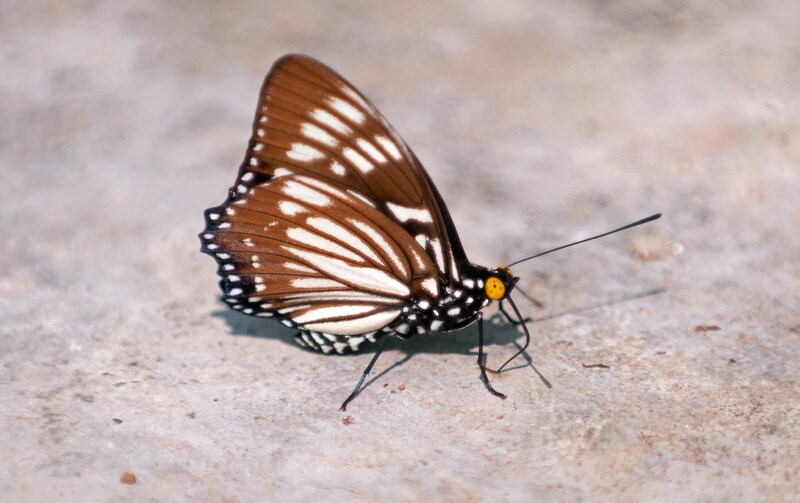 Some female forms mimic the male of one species (such as the Magpie Crow, Euploea radamanthus), whilst other forms mimic the female of the same species. Other forms mimic different species altogether. It is worth mentioning that this butterfly is in the family Nymphalidae, wheras the species which it mimics are in the family Danaidae; in other words they are completely different in terms of their taxonomic position. Yet the female Courtesans have evolved to mimic the different butterflies, the so-called models. This form of Batesian mimicry – going by the mouthful of a term, ‘female-limited mimetic polymorphism’ – is sustained by the fact that the butterflies that are being mimicked are poisonous, so looking like the distasteful models (which predators such as birds have learnt to avoid) offers a clear selective advantage to the female mimics. The situation is slightly more complicated in some species which also have non-mimetic females (! ), but in this species, all of the female forms are mimetic. Ray Cannon's nature notes A multi-frocked courtesan!